Disclaimer: Bulletproof products have been provided to me for the purpose of this review by Bulletproof as free samples. This has not influenced my review and the opinions expressed in this post are my own. I am not affiliated with Bulletproof. Most of you are familiar with Bulletproof coffee aka BPC - Instagram and other social media are flooded with pictures of mugs filled with frothy coffee. For those who are new to it, it&apos;s a blend of coffee and healthy fats, including grass-fed butter (more omega 3s than grain-fed) and MCTs. Adding fat to coffee may sound odd but it&apos;s surprisingly delicious. Contrary to common belief, it won&apos;t make your coffee oily and if you blend it well, you&apos;ll get amazingly creamy coffee. Although BPC is not for everyone, it can be used as a supplement as part of a healthy ketogenic diet. 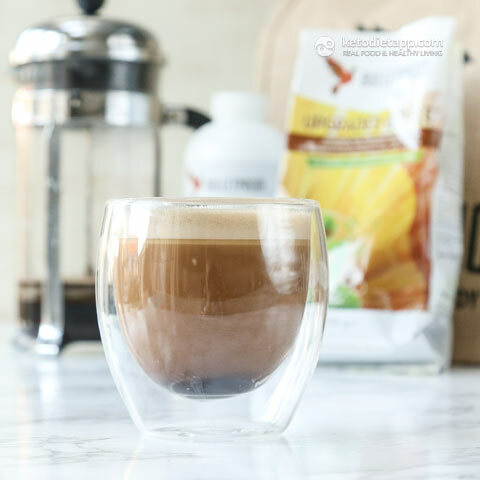 Although for most people, bulletproof coffee (BPC) refers to a cup of any "butter coffee", the original BPC was created by Dave Asprey of Bulletproof. It&apos;s made with high-quality coffee beans and is known for having the lowest mold toxin levels. As I found out myself, it tastes amazing even without sweeteners or cream. In fact, I can drink it black without anything added to it. 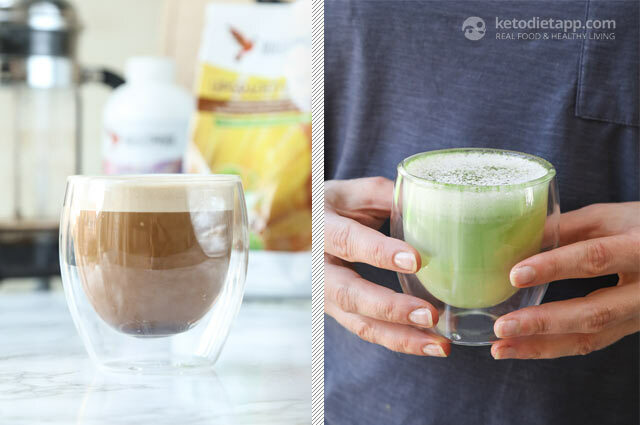 If you are interested in the science behind Bulletproof Coffee and how it&apos;s produced, have a look at this post on Dave Asprey&apos;s blog. Is BPC Suitable for Everyone? BPC may be a great addition to your diet, but it&apos;s not for everyone. If you are sensitive to caffeine and/ or MCTs, avoid drinking BPC or try alternatives. Use green tea, matcha or herbal tea instead of coffee - and virgin coconut oil instead of MCT supplements. If you are trying to lose weight and you&apos;re stuck at a weight loss plateau, try skipping BPC for a few days. While for some people BPC helps suppress hunger, others may end up eating extra calories. Keep in mind that calories do count and a cup of BPC is at least 200 calories (kcal). Bulletproof Matcha Latte for those who don&apos;t drink coffee. Apart from matcha, you can use any of your favourite tea. You can add some healthy fats such as butter, coconut oil or Brain Octane Oil to my Chai Tea Latte and prepare it just like BPC. Medium Chain Triglycerides (MCTs) are extracted from coconut oil. They&apos;re known to improve brain function and support ketosis. In most supplements, the taste is neutral and you won&apos;t be able to detect it when used in recipes. There are three main products on the market: MCT Oil, XCT Oil and Brain Octane Oil. Coconut oil contains mostly C12 (about 50%), while MCT oil blends are made of C8 and C10. That&apos;s why it&apos;s good to include both in your diet. XCT oil is a product developed by Bulletproof and it&apos;s a blend of two MCTs: C8 and C10. Compared to Brain Octane Oil, which costs twice as much as XCT oil, it&apos;s an affordable product and it&apos;s good to start with if you are planning to use MCTs as a supplement. 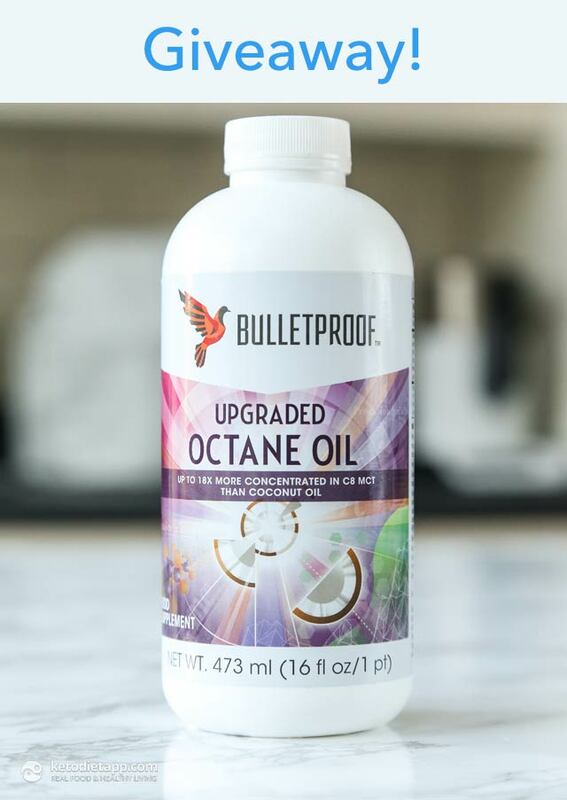 Brain Octane Oil from Bulletproof is made with pure C8. It provides a quick source of energy and maximum cognitive benefits. I could tell the difference when I started adding it in my coffee and smoothies, as I experienced an immediate energy boost which can be really helpful if you just started following the ketogenic diet and feel tired (remember, it take 3-4 weeks to get keto-adapted). I don&apos;t use it every day but it helps having some before going to gym or when I need to work and concentrate. When I first tried MCT oil a while ago, I didn&apos;t know about the potential side effects and digestive discomfort. If you are new to MCTs, make sure you start with a small amount (such as a teaspoon) and gradually add more to avoid stomachache and/ or diarrhoea. Both MCT oil (or XCT oil by Bulletproof) and Brain Octane Oil can be used in a variety of recipes - they can be used interchangeably. Start with small amounts and add more once you get used to it. Keto Smoothies and Shakes for extra energy. Salad Dressing and Vinaigrette - a great way to boost your regular dressing. Keto Ice-Cream Recipes - MCT oil and Brain Octane won&apos;t freeze and will keep the ice-cream from getting hard when frozen. Macronutrient ratio: Calories from carbs (0%), protein (1%), fat (99%). Pour your freshly brewed coffee in a blender or a heat-proof jar (if using immersion blender). Add butter, Octane Oil, and any suggested optional ingredients. Pulse until smooth and frothy. If you&apos;re not using all the coffee at once, do not leave it in the French press. Instead, pour it into a jar or a thermal carafe or thermal mug to keep it warm. I am totally new to the keto diet. Your blog and the information I am reading is fantastic! Thank you! Hi. My name is Sarvenaz. I'm live in iran and I don't have have any access to MCT Oil. Can I use coconut oil instead of it in my bullet proof? However, increasing your fat intake only to boost ketones is not something I would recommend for most people as this could lead to weight gain. Have a look at this post for more about the role of ketones: The Ketone Craze - Who Really Benefits From High Ketone Levels? I been on BCP diet for a month ...So happy with my results. Getting ready to embark on ketogenic diet for medicine induced weight gain. Gave up the pain medicine, now want to give up the weight! I've read about bulletproof coffee, anxious to try! I am new to all of this and very interested in a bulletproof coffee. Can't wait to try it!! I have been trying this with ghee and coconut oil. I use BPC mainly for my brain. No memory loss for me! Bulletproof sounds like just what I need every morning. Luv your blog! Bullet Proof Coffee..Where have you been all my life?? I love my bulletproof coffee but it is time for an upgrade! It keeps me from getting hungry for hours! Bulletproof is my go to for my heathy fat! Not only does it get me into ketosis quickly it also keeps me there! My husband and I always have BPC every morning and I usually do not drink coffee because did not like it however my husband got me started drinking BPC ever since. I love bullet proof tea! Love my bulletproof coffee in the morning, I personally think its better when you make it in blender and at the end a dash of nutmeg or raw cocoa powder on the top! I am new to your blog and am just beginning to mentally digest all that is available to help my husband and I as we continue on our new Keto eating plan. Thank you for your site. I would love to try this! A few of my friends mentioned this to me and I want to combine kept with an awesome new morning beverage like this. The science of Bulletproof coffee is exciting! Coffee plus MCT (or any fat for that matter) is the BEST! Awesome! I would love to try this out and see how it compares to my regular MCT oil. I've tried coffee with coconut oil and sweetener when I was out of milk and creamer. It was okay. My favourite bulletproof product is the affordable XCT oil, I use this daily. I've never tried the BPC diet but I do like the coffee and supplements. would love to try some MCT oil, but not in the budget ATM, so I hope I win! I haven't tried yet, so I hope I win! Brain Octane is wonderful. I love using it! I love BPC! I feel energized and alert!! I've used the MCT oil, but would love to try the Upgraded Octane oil. I have read conflicting reviews about MCT oils. Then I read the label on the Brain Octane oil to see that it could be from coconut oil OR palm kernel oil. Bummer! Palm kernel oil is unethically sourced and I'm trying not to use it if it doesn't specify HOW it's sourced. I DO LOVE your blog and information! Thank you! This looks awesome! Id love to try it! Lol ....I bet it's going to be the octane oil! Hey, thanks for everything. I don't drink coffee, but would be interested trying this with tea to further my Keto efforts. I could use the extra energy. 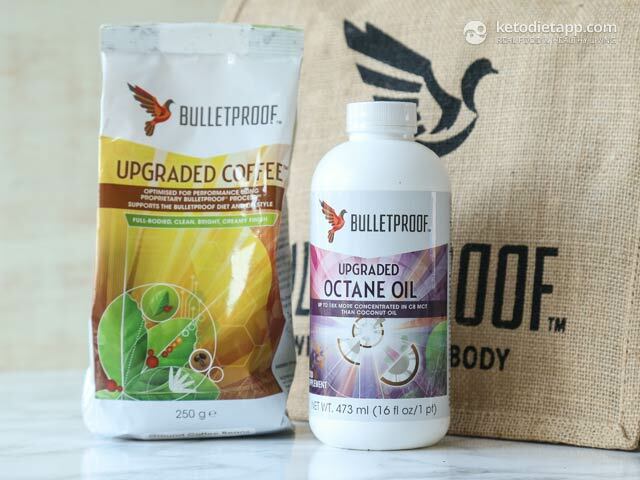 I haven't tried any of the Bulletproof products yet, but I really want to try the oil. I have enjoyed bullet proff coffee. I would like to try the brain octain. I am beginning keto follower (6 weeks) and anxious to further explore cause I love my coffee! I love BPC. . .its one of my favorites every morning. NOt only does it energize me in the morning, it sustains me until lunch. Super yummy and I do love adding cinnamon to my coffee for the fall. Coconut oil and MCT have worked great in the past wit grass fed butter. I would love to step it up a notch with Octane Oil. I've never tried the products but I'm definitely interested in the Octane oil! Great giveaway! Good luck everyone! I look forward to trying bulletproof MCT. Bullet proof coffee is the best breakfast ever! I am excited to try this recipe ! So easy! And it looks delicious! I have never tried BPC, but anything with butter is high on my list!! EVCO and grass-fed butter....mmmmm! Best way to start the day! I don't have a favourite bulletproof product yet as I've never tried any! Though I have made butter coffee before and whilst not exactly the same as a latte, once you get used to it, it's quite nice! I don't have any of this. Hope I win so I can try it. I enjoy BP coffee on occasion. I use butter and MCT oil and add a bit of Collagen to it as well. I find it gives me a boost of energy that lasts quite a while. I do need to account for it in my calories for the day though or it is too easy to go over. It is really good with a bit of toffee flavored stevia drops in it - tastes like a caramel macchiato. Never tried Bullet proof products before, but would love to try some! I like to drink bulletproof matcha latte though! Extra Virgin Coconut oil for me. Best part of feeling full in the morning. Oh, and grass fed butter from local farmers. Better than you imagine it to be and make coffee oh so much better when put in their coffee. Brain Octane is my favourite Bulletproof product. I've been too afraid to try bulletproof coffee you until now, but maybe now I'll give it a try! Thank you for this informative post!! I love bulletproof coffee! Thanks for a great post! I love coconut oil, but the Bulletproof original Brain Octane is totally my preference for BPC. Having the Upgraded would be amazing! Just started, and I would love to win this. are there long term benefits from MCT oils? or are they just for an immediate "brain boost"? do they help with any autoimmune function repairs? Coconut oil, which is high in MCTs, has a beneficial effect because it suppresses inflammation and helps repair tissues. I have Hashimoto's, which is also an autoimmune disease, and use coconut oil almost every day. I suppose the effects should be similar for MCT oil supplements, as the beneficial effects are related to medium-chain fatty acids found in coconut oil). Sounds great! BPC definitely help getting healthy fats in ;) would live to try this! A friend made me a BPC... I love it and will be ordering this weekend !!! Also just started reading the Bulletproof Diet book! My husband swears by this stuff... would love to win a free bottle. Thanks Martina! I haven't gotten the chance to really try any of these products, however I have had it with good ol butter and coconut oil, but I would absolutely love to try these products out and get more fat in my diet!! Are you sure it's related to BPC or do you feel tired before consuming it? It does take about 20 minutes for the caffeine and MCTs to kick in  I'd love to see if anyone has similar experience and tips? I haven't tried any of the Bulletproof products but I do like my coffee with fat (butter or HWC). I must admit, I've never tried a for purchase bullet proof coffee, but have attempted with similar results as your flop pictures on my own!! I'd love to see what it tastes like!! Plus I love the benefits it provides. My coconut oil can only do so much! I love bulletproof coffee. Would love to try it with the upgraded coffee. Love your blog! Ive never tried it, but I love coffee and would love to give it a shot!! My fave would definitely be the Upgraded Octane Oil! I have not tried any yet, but would love to! I've not tried their products. Would be interested in trying. Love BPC, I have it with Kerry Gold two or three times a week! New to the keto diet 2 months in amd i am loving it. Bulletproof coffee is amazing! I like to drink it iced on warm days. I've never tried any of the official bulletproof products because they're pretty pricey. I'd be interested to try the coffee sometime and see if I likenit as much as my favorite brand. I haven't tried their oils yet but I have tried the coffee and that's pretty good. I've used other brands of MCT oil but I'd love to try this one. Heard a lot about it. I would love to test this product before buying it because shipping to France isn't easy or cheap!!! it sounds fabulous !!! I have been drinking BPC since I started eating Keto,I love it! Just started making the Matcho tea and I am going to try the Matcho Bullet now! I use Bulletproof XCT oil, Brain Octane oil and Brain Octane gel caps! I think Bulletproof coffee has been my savior in weightloss. Love, love, love Kerrygold grass fed butter, organic valley ghee, and fatworks lard as fat sources. I'd love to try upgraded octane oil and add to my list of favorites! I typically use coconut oil but will defiantly try this. I like the coffee and always wanted to try the obtain oil for my muddled brain. Even while walking across Spain, I stirred their fresh butter into at least one cup of cafe con leche per day. These are great products and have really had a positive effect on my life. They compliment a healthy, purposeful and clean life! I love my grass fed butter in my BPC! Would love to try this! BPC is always how I start my day. I'm never very hungry in the mornings so drinking something like this has always been perfect for me. Would like to try this. My adult son has high praises for this product! A pinch of salt makes it sooooo yummy no matter what flavor I'm going for. Sometimes I go for primal coffee and add 1-2 raw eggs. Depends how hungry I'm feeling. I have never tried a BPC but am would love to win the Octane Oil and give one a try! Just discovered BPC a couple of weeks ago and am still working it into my diet. Thank you Martina for all that you do for everyone out here trying to find the truth about eating healthy! Sounds delicious and would love to try it!! even bought a small blender to be able to have it when I am traveling. Our whole family enjoys the Brain Octane MCT oil everyday in our BPC or BP Hot Chocolate (9yr old boy)! I would really love to try this product, It sounds great! I love your blog! Thank you! And I love BPC. The brain octane oil is amazing!!! Love BPC! I add raw vanilla powder and it's delicious! I'd love to win this! I love Bulletproof coffee! I love Bulletproof XCT Oil and the Brain Octane sounds AWESOME!! I've never tried it, but I would love too! I have been drinking the bpc for about 8 months now and I am never hungry after drinking it. I just ran out of my MCT oil and now that you mention the digestive issues, I now know what had caused some of my discomfort...but it didnt happen frequently so perhaps on some days I used to much. I dont always measure...YIKES! I would love to try the Octane oil to feel the difference. I love BPC but have never used this product and would love to try it! Been drinking bullet proof coffee on and off for a few years. Recently transitioning to an athletic ketosis diet. This would be awesome. Good Luck to all of us! Would luv to try this product! I love the oil and use it in my tea. I've tried and love egg latte (with egg, butter, coconut oil and coffee), which is similar to BPC, but it would be great to try the real thing! Oh this sounds yummy, I would love to try it! Just started keto diet a few months ago. Would love to win this. I find by drinking bulletproof coffee in the morning, I do not get any urges to snack until well after midday. It keeps me full. I love it. I sometimes add organic Ceylon cinnamon for a different flavour. Pure loveliness. LOVE LOVE LOVE BPC! Thanks for sharing. Such a great site! I would love to be able to add this to my keto routine!! wissh to add it at my catalogue...my greek customers would love it! I love MCT oil's benefits! I have tried the Bulketproof coffee - it really works and tastes great!! I've been hearing a lot about these products lately but haven't tried them yet. We have been using the Lean or Now brand, but looking for others that work equally as well. I appreciate the detailed information about the product. I really hope i win this. I drink BPC every morning! This blog is fantastic, its given me soo many great ideas, and helped keep me on track! Keep up the good work!! I love bpc. I need to start having more of it. I find that on an empty stomach, coffee makes me so acidic so I usually save it for a midday treat. I drink BPC every day but I have only used the coconut oil. The more I read the more curios I am about trying some type of MCT oil. Would love to try this and review it. I would like to win this and try it out! A friend recently tried this and said it was great. I can't wait to give it a try. I regularly use Bulletproof XCT in my BPC, but my favorite product is probably the book. It has amazing information an delicious recipes!! Sounds yummy! Have never tried BPC. I would love to win this and give it a try. Thank you for the opportunity. I do enjoy a blended coffee, but have not had a true BPC. 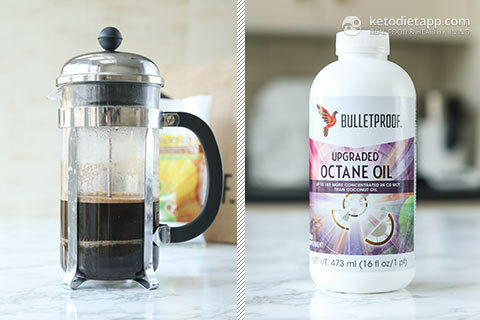 Would love to try Bulletproof's Octane Oil! Have bulletproof coffee every day, but take the weekend off. I also use heavy whipping cream one tablespoon. I'd love to try these products and winning one would be even better. Wonderful! I love Bullet Proof Coffee. I have not tried the Octane Oil but if it is Paleo approved then I am all in! I love Paleo. I feel FANTASTIC! Thanks! for all your knowledge and widsdom and ever giving recipes. I just can't say enough good things about BPC and Paleo! I have been drinking BPC for a while now using MCT oil, cinnamon, and Stevia. I have been very interested in Brain Octane oil for a while now but it's just really expensive. I would like to test the difference over regular MCT. I have never had BPC before because I don't have the correct ingredients to make a cup worthy to drink. Hopefully this allows me the chance to find out what I am missing out! Thank you for the opportunity to win! I love your blog. BPC is a winner! I would be interesting to try this new product. I am a huge fan of BBC! I've used butter but I've often wanted to try coconut oil or other to give myself a healthy boost. I have never tried any products yet, so this would be a first. I welcome the opportunity to try this product as I believe it is not available in South Africa. Love the blog and the great recipes. I have never tried any of the BPC products, would love to try it. I love BPC and look forward to having it every morning with Brain Octane, vanilla powder and a little cacao. I would love to win this prize. I have always wanted to try BPC but was too afraid to. But now that I am determined to get keto adapted I'm ready to try it. Thanks for the recipe to use in the meantime. Drink bulletproof coffee every day so would love to win this and try octane oil. I'm not a coffee drinker but I love it in hot tea. I have found that if it's inconvenient to blend my BPC (like at work), I'm fine with just stirring it vigorously. YMMV. Never tried BPC because I don't like coffee. I wonder if it can be done with black tea. Would love to win - never win anything. I use just coconut oil, never tried this so that would be something new to try. I drink a cup most days of the week. Keeps me satisfied for hours. Love your site and would love to win this! I would love to try brain octane in my coffee!!! I love the bulletproof brain octane oil! Would love to try their coffee! I enjoy the Octane oil and always looking for new Keto recipes for my daily chocolate and sweets. 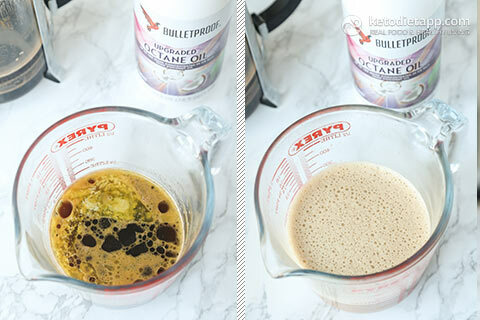 I only recently started drinking bpc and I'm loving it more and more - so foamy and delicious, and keeps me so energized throughout the morning! Love your blog!!! Been using your recipes and guide for months. I'm really loving the KetoDiet and I'd love to try this Octane Oil!!! I have never tried any of the BPC products, sounds good! I've made butter coffee but not real BPC. Would love to try it! I've tried both both XCT oil and coconut oil. There is a huge difference. The biggest is that coconut oil is much worse on my tummy! I have BPC daily along with my wife. We add the upgraded collagen as well and have noticed improvement in skin, hair, and nails. Absolutely better for you than regular coffee. I drink BFC a few times a week. It keeps me focused and satisfied all morning. It tastes great. Sounds interesting, I would love to try. I use the Instamix while traveling as access to quality fats is very limited on the road. PBC at home also includes cocoa and cinnamon. Love it! I use BPC often through the week. It keeps me full for hours! Would love to try as need.my coffee all day. My favourite BP product so far has been XCT oil! I'm excited to see the difference in performance using the Brain Octane Oil! My favorite is the Octane oil because it makes my energy levels skyrocket. It also satisfies my hunger when I go to work at 4am. I would love to try this product in place of coconut oil in my coffee. I have not tried any of the bulletproof products yet. This would be the first. I never try it but I'd like! I have been super eager to try the XCT or Brain Octane. I don't have a favorite yet. I enjoy bulletproof coffee. Would like to try the octane oil in place of coconut oil. I make this on occasion. So creamy and delicious! I read the books, I use the re pie, but haven't tried these products. Interested in the high octane now though! I love BPC coffee and have it every morning. I also enjoy the matcha green tea latte as well. I have tried MCT oil and love my BPC I dont drink it every day because it does slow me down in weight loss but as a treat its wonderful. I would love to try the Octane oil to see if it makes a difference. My favorite product would have to be Brain Octane MCT oil, it is the only Bulletproof brand product I've tried! Bullet proof coffee saves my day. Love it! I've only tried BPC once. I forgot that butter & coconut oil didn't really have a cooling effect on the freshly brewed coffee - like adding cream straight from the fridge would - so when I took my first sip, I burnt my lips and tongue, ouch! I have been meaning to give it another go - and MCT Oil too - as I've read so much about the benefits. Just have to remember to let it cool down first! I love bullet proff coffee! Its bae ❤ however, I've never tried upgraded octane oil but would love too! I tried brain octane a few months ago, I would LOVE my own stash!!! I love bullet proof coffee! It took a little getting used to, but I love using it on days I have to work!! I can feel the extra pep in my step it gives me to start the day off right! I have never tried any Bulletproof products, would love to win the oil and try it! I drink BP coffee every morning! I have fallen in love with BP coffee, with grass fed butter and coconut oil. Would love to give the octane oil a try! I enjoy bullet proof coffee on my workdays - helps get me though the morning. I have only used MCT oil and butter so I'm would give brain octain a try. 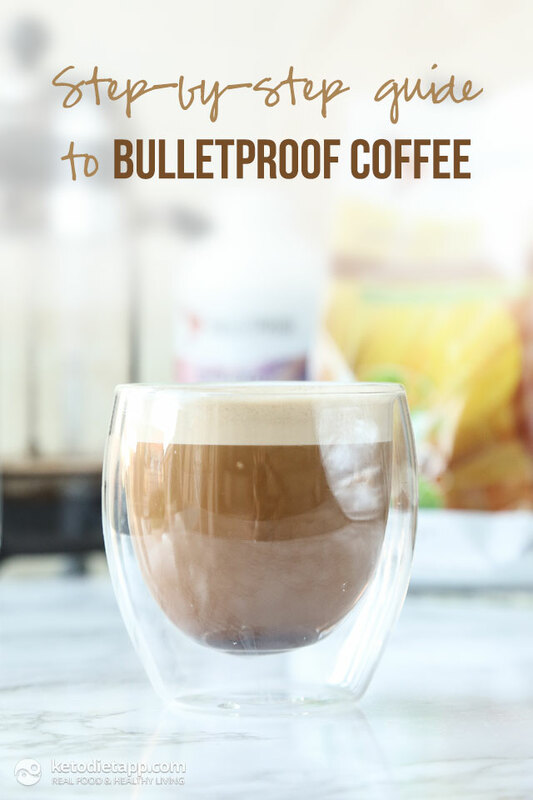 Bullet Proof Coffee has completely changed my way of eating and drinking coffee! Love adding chocolate powder or vanilla makes such a treat! Love BBC! Thanks for the additional ideas.